WHITE HOUSE – Blue Devils senior defensive end Tyler McMurtry was named the 2017 Defensive Most Valuable Player in Region 5-4A with the team announced on Friday. White House (11-1, 6-0) won the region championship, and Springfield (11-4, 5-1) advanced to the Class 4-A Blue Cross Bowl and lost to Greeneville in the state championship game. 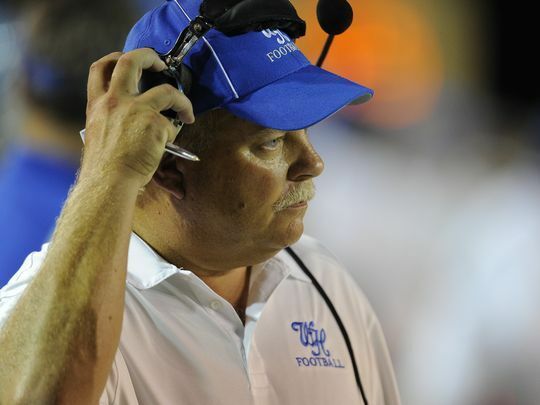 White House head coach Jeff Porter, in his 31st season, was named the Coach of the Year after leading the Blue Devils to an undefeated regular season for the third time in his tenure (1997, 2004, 2017). McMurtry broke the single-season sack record at WHHS with 9.5 for the year, along with a team-leading 119 tackles, 34 quarterback hurries and four fumbles caused. He finished his career one sack short of the career record for sacks at White House. The Blue Devils also received 10 positional award winners for the All-Region 5-4A Team. Junior quarterback Andrew Nixon passed for 1,376 yards and 14 touchdowns, and also rushed for 143 yards and eight touchdowns. He led the team in scoring with 54 points. Offensive line seniors Dawson Bragg at right tackle and Elijah Zweydorff at center were named award winners in the trenches. Both contributed to only five sacks allowed in 590 snaps for the Blue Devils, and 1,880 rushing yards. Bragg also had 42 tackles and three fumble recoveries at defensive end, and Zweydorff had 52 tackles and two fumbles caused at defensive tackle. Senior Brett Drake won a first team receiver award, leading the team with 18 receptions for 395 yards and three touchdowns, and rushed 13 times for 61 yards and a touchdown. On defense at corner, he had 64 tackles and six passes broken up. Junior Eddy Walker was the third leading tackler on the team at linebacker with 95 stops, but he was awarded on offense at tight end with six catches for 87 yards and a two-point conversion. Junior kicker Jacob Harper made 3-of-5 field goals and 38-of-41 PATs to be named the first-team kicker of the year. Harper also kicked off 66 times for 2,918 yards and six touchbacks with an average of 44.21 yards per kick. Senior Josh Dailey started on the offensive line and at defensive end before an injury ended his season, and he was named to the defensive line award winners for the region. Dailey had 55 tackles and eight tackles for losses. He was joined on the first team defense by award winner Colby Taylor, a sophomore linebacker with 105 tackles to be second on the team. He also had 11 tackles for losses and is the youngest Blue Devils member of the team. 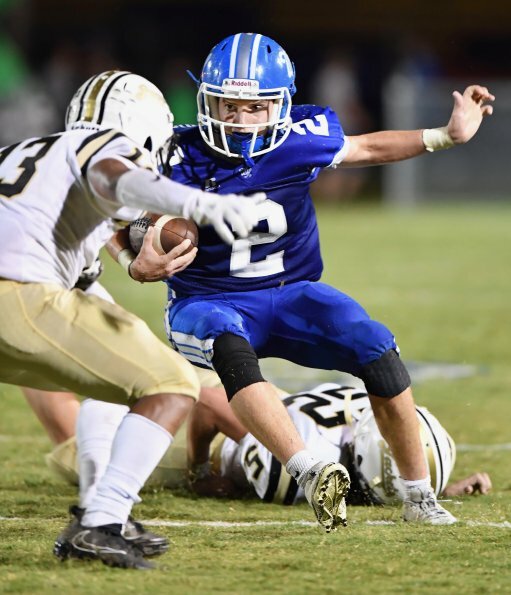 Senior Miller Lowe was named as a defensive back award winner, making 62 tackles with 10 tackles for losses, playing a flex/safety position as a defensive back and outside linebacker for the Blue Devils. Lowe also had three catches for 48 yards and four rushes for eight yards and a touchdown on offense. He was joined as a defensive back winner by junior Preston Sharber, who led the team with 564 yards rushing and eight touchdowns, and caught three passes for 23 yards, had four kick returns for 73 yards, but had 36 tackles and a team-leading four interceptions for 59 yards. He was second on the team in scoring with 48. Five at-large members (no positional award) were selected to the team from White House. Senior Seth Bumbalough was the all-around leader for White House until his injury at Portland ended the season. Bumbalough had eight catches for 178 yards and three touchdowns, 13 rushes for 124 yards, four kick returns for 136 yards and an 86-yard touchdown, and two punt returns for 55 yards. He was fourth on the team with 36 points, and made 26 tackles with two pick-six interceptions for 62 yards and a pair of touchdowns. Senior Carter Hunt had 63 tackles, one interception and three fumble recoveries, and rushed 36 times for 132 yards and five touchdowns. Junior Keyvan Dickerson rushed nine times for 51 yards and caught one pass for 32 yards as the primary blocker at fullback for a Blue Devils offense that rushed for over 1,800 total. Senior Kevin James caught six passes for 107 yards and four touchdowns, rushed two times for 16 yards, had three kick returns for 40, and 22 defensive tackles with three passes broken up and two interceptions. He also punted 27 times for 921 yards and a 34.1 average with nine kicks inside the 20 and a long of 64. Senior Tyler Ridings was a starter on the offensive and defensive line, and was named to the team after 47 tackles with six tackles for losses. He was the fourth starter from the offensive line to make the team. The region awarded an Academic Award to each team represented, and White House selection was senior Miller Lowe based on his grade point average. Congratulations to the Blue Devils who made the team!